Parliamentary results gave victory to the ruling Zanu-PF party in the first vote since the removal in November of long-time leader Robert Mugabe. But the opposition says Zanu-PF has rigged the election. The opposition MDC Alliance insists its candidate, Nelson Chamisa, beat the incumbent President Emmerson Mnangagwa. Zanu-PF, which has been in power for 38 years since the country gained its independence, denies there has been any rigging and has called for calm. President Mnangagwa said the government was in talks with Mr Chamisa to diffuse the crisis and “we must maintain this dialogue in order to protect the peace we hold dear”. In a series of tweets, he said he wanted an independent investigation to ensure that those behind Wednesday’s violence were brought to justice. Human rights group Amnesty International’s acting secretary general Colm O Cuanachain said in a press release that the “militarisation” of the election aftermath was “muzzling freedom of expression, association and assembly”. The country’s electoral commission said that Zanu-PF had won a two-thirds majority in parliament – prompting protests in the capital, Harare. 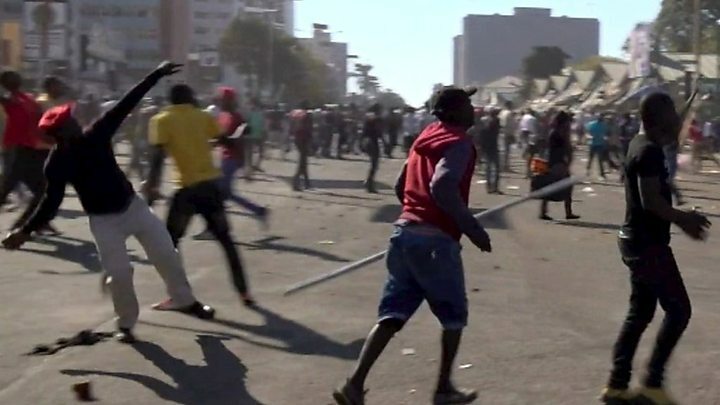 Home Affairs Minister Obert Mpofu said the government would not tolerate the protests. More than five million people were registered to vote, and there was a turnout of 70%.